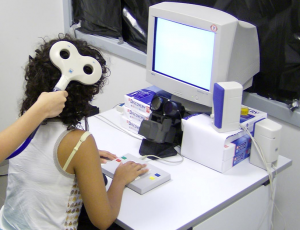 The Psychophysics facility allows the implementation of behavioral experiments on normal subjects and neuropsyhological patients, the preliminary testing of stimuli and procedures to be later carried out with other core facilities (e.g., fMRI, MEG, etc) as well as the training of experimental subjects/patients. The facility is equipped with hardware-software platforms allowing the delivery of visual and auditory stimulation, the registration of subject’s responses with different effectors (hand, foot and vocal responses), and the tracking of 3D motion of body segments (through an electromagnetic device: 3 Space Fastrak, Polhemus Navigation; Colchester, VT, USA). Eye-movements can be also tracked, through a remote monocular infrared eye tracker (ISCAN ETL 400; RK-826PCI), that uses a video-based, dark pupil-to-cornea reflection method to record eye positions during picture and scene analysis, as well as to simply verify the fixation maintenance. With a sampling rate of 120 Hz, it allows a high resolution recording of the eye position and pupil size in real time with an accuracy tipically better than 0.3° over a +/- 20° horizontal and vertical range. 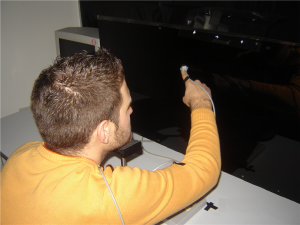 A plexiglass panel with LEDs mounted on is available for the study of reaching movements towards visual targets in space. Stimuli are usually generated by a control computer located outside the psychophisics room, running the custom software GagLab (developed by Gaspare Galati at the Department of Psychology, Sapienza Università di Roma, Italy), implemented in MATLAB (The MathWorks Inc., Natick, MA, USA) using Cogent 2000 (developed at FIL and ICN, UCL, London, UK) and Cogent Graphics (developed by John Romaya at the LON, Wellcome Department of Imaging Neuroscience, UCL, London, UK), and allowing time-locked presentation of visual and auditory stimuli with millisecond timing accuracy, synchronized with fMRI, TMS, EEG, MEG. Other softwares are also used, as E-Prime. A wooden simulation of the fMRI magnet bore is also available in order to reproduce the fMRI setting in a way as much as possible similar to what subjects will experience (i.e., laying down on a narrow semi-cylinder).